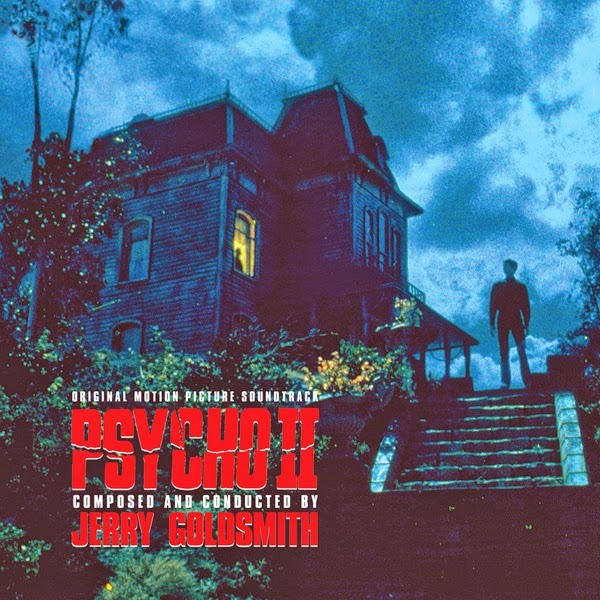 For the 1983 Universal Pictures sequel Psycho II, composer Jerry Goldsmith retained the coiling, aggressive string writing he’d developed through the '70s, while grounding the score with a melody for ghostly electronics and strings -- one that gets to the heart of the Norman Bates character in an unexpected way, capturing a sense of innocence and sympathy. In the score’s main title, Goldsmith’s wistful theme for Norman plays against a repeating, four-note piano figure, one that slithers off in an odd direction as it’s about to repeat a fourth time. Like mother and son, the piano motif is related to the theme for Norman and hints at his madness, driving numerous cues in the score. Goldsmith fashioned roughly an hour of music for Psycho II, including using Bernard Herrmann’s legendary shower murder set-piece from the original film to open his otherwise all-new score. The original 1983 MCA vinyl soundtrack featured exactly 30 minutes of music, including the Herrmann opening murder sequence. In addition to missing numerous important cues, the album shortened three of the nine cues present. Consequently, more than half of the score is making its premiere appearance on this Intrada CD. Intrada was given access to the complete multi-channel recording session masters and assembled the entire score in picture sequence. The master elements were in pristine condition and included all of the complex electronic overlays with their vast array of throbs and gurgles, child-like bells and distant motifs—and those terrifying knife-like slashes. Psycho II presents Norman (Anthony Perkins) as a protagonist, when a strident Lila Loomis (Vera Miles) harangues him on the day of his release. Furtive and gentle, Norman is taken in by Mrs. Spool (Claudia Bryar) to work at a local restaurant where Norman is soon employed as a cook’s assistant. Norman invites hapless waitress Mary (Meg Tilly) to stay with him at his decrepit house, unaware that Mary is the daughter of Lila. When signs seem to indicate Norman’s mother is exerting her influence on her well-meaning son again, Norman turns to Mary for solace, and despite her involvement in attempting to incriminate Norman, Mary begins to sympathize with him. But things naturally don't work out for the best.